Vanessa’s birthday is 3 days before mine. We shared a dinner party in Merah Putih, a gorgeous restaurant in Bali, last December. On my actual birthday, 9th December, Al celebrated with me. He couldn’t wander far from his work place with an hour’s (at most 2 hours) break so we decided to lunch at nearby. I have always linked French cuisine to be romantic cuisine and more appropriate for dinner but what the heck, it’s my party and I can have French in the afternoon if I feel like it. So the venue was decided, Absinthe at 72 Boat Quay. 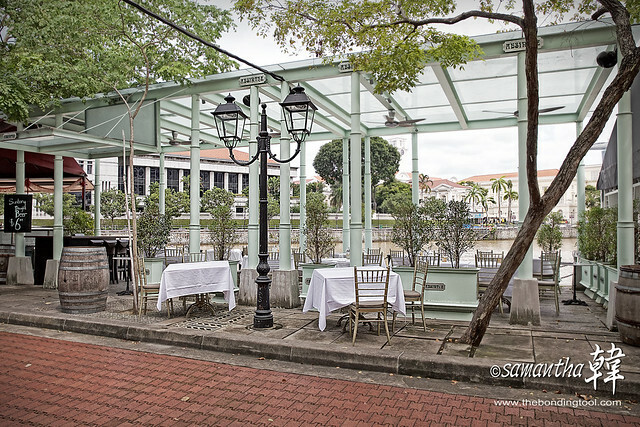 Outdoor seating available, overlooking the Parliament House and Singapore River. Absinthe is the brain child of long time friends Vincent Jauguiberry on one side and Diego Chiarini & Stephane Colleoni of the famed OSO Ristorante on the other. From warm and cozy atmosphere, to the delicious and tasty dishes served, not forgetting of course the extensive selection of reasonably priced wines covering not only most of France wine producing regions but as well a fair representation of others countries, Absinthe was created as a comfortable, convivial and unassuming place. Chef Nicolas Reynard’s cuisine is deeply rooted in the French heritage, influenced by his younger years in the South West Region; he shows a respect for the produces he uses; enhancing them rather than merely blending them together. 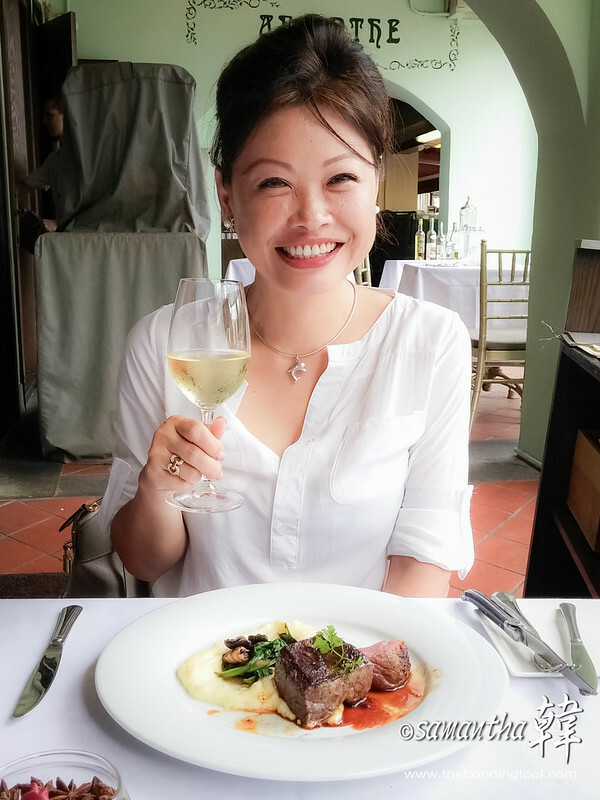 Absinthe tries to somehow demystify the idea of the French Restaurant in Singapore; it is a lively and friendly place, serving delicate yet generous portions and affordable prices, we believe in the concept of comfort food as well as professional yet personable service. 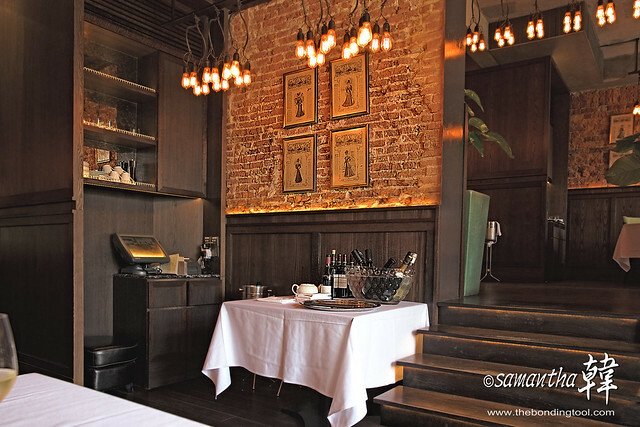 Warm cozy atmosphere on the upper floor of the restaurant. Restaurant Manager Vincent Jaureguiberry’s roots are from the Basque region of France. 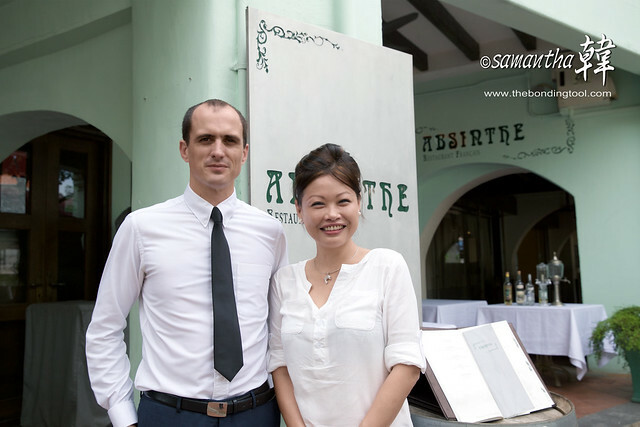 Vincent arrived in Singapore in 2005 and work for Saint Pierre Restaurant for 2 years. Vincent has joined the team at Absinthe as Restaurant Manager and you can look forward to his warm welcome and his wine recommendations. Back on track… My lunch was a set meal. 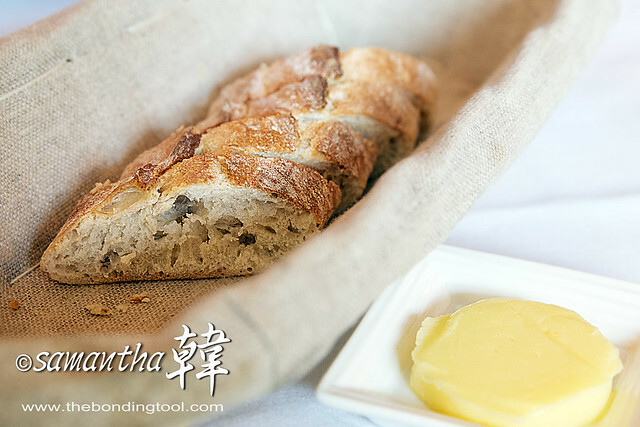 I found the standard set lunch to be value-for money at S$38++ for 3 courses. We were seated in the restaurant and found it to be a little stuffy that afternoon and requested for our meal to be served downstairs in the open. Baguette or what I like to call mini French loaves. Crusty outside and “meaty” inside. I wonder if they baked these from scratch. I liked it so much we had 2 baskets. 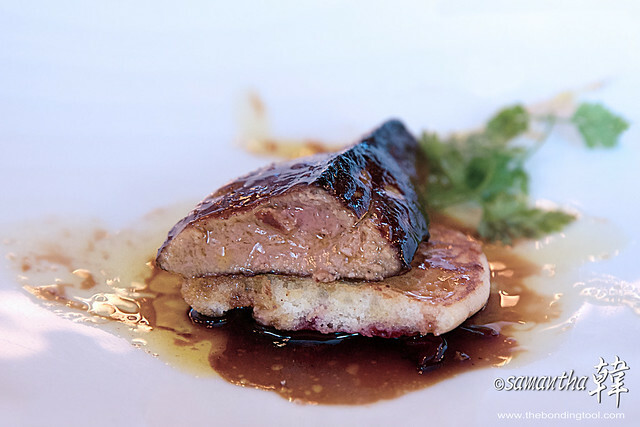 Pan Fried Foie Gras, Figs and Warm Jerusalem Artichoke Blinis (add $10 to the set meal). I love offals/organ meats and whenever there’s liver, I must have it. 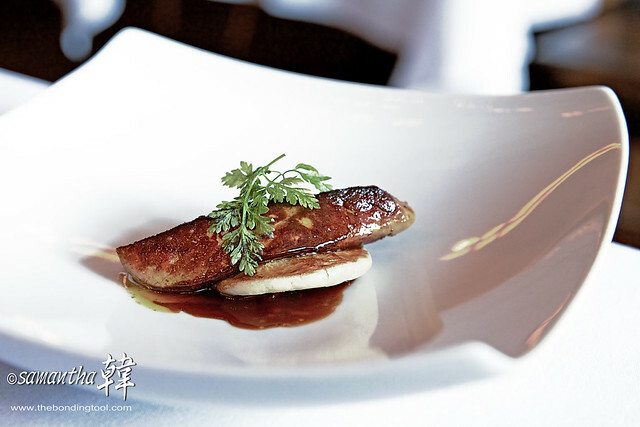 The foie gras here was done very much to my liking. Not overly done, it was velvety smooth and rich. We started with a bottle of white wine while having foie gras and graduated to red for our mains (beef). 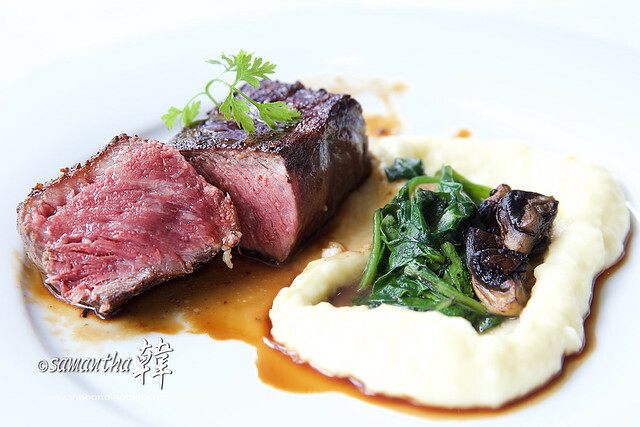 Grass fed beef with mash, spinach and mushrooms. Grass fed beef tastes better the corn fed, always! The beef was juicy, very pink and not so bloody until iron was detected. 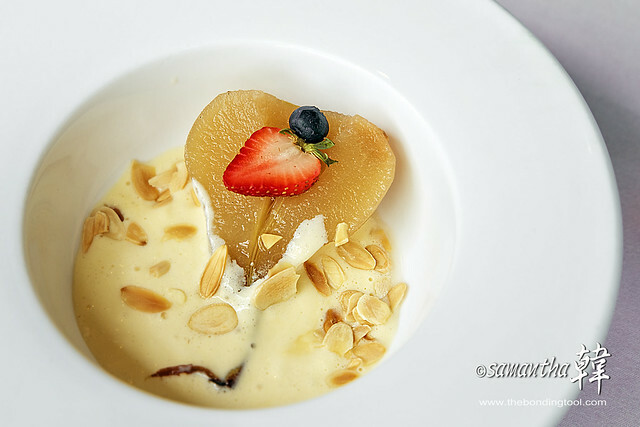 Poached Pear served with Custard. 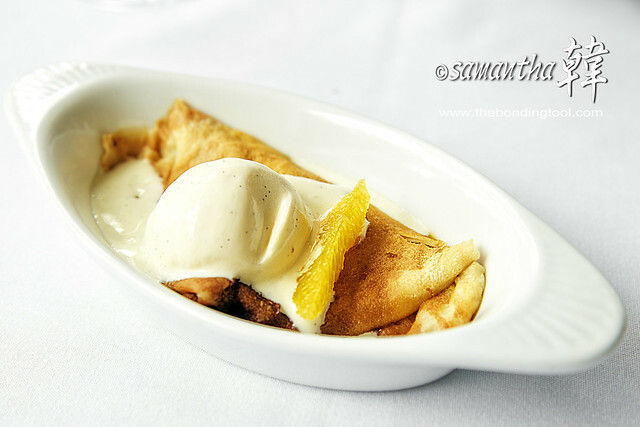 Crepes served with Vanilla Ice Cream. Quoting their website, “Once in Absinthe make sure you do taste one of the Absinthes we have on offer and experience the “Green Fairy”! 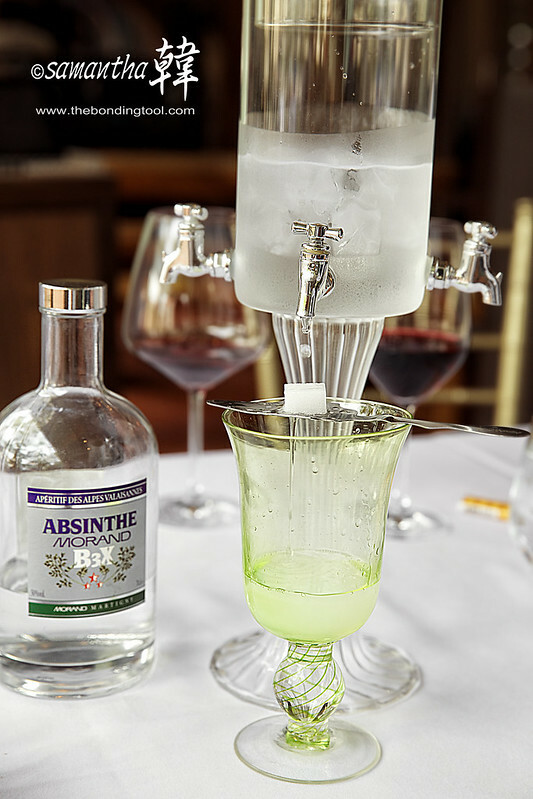 Absinthe is historically described as a distilled, highly alcoholic (45–74% ABV / 90–148 U.S. proof) beverage. It is an anise-flavoured spirit derived from botanicals, including the flowers and leaves of Artemisia absinthium (“grand wormwood”), together with green anise, sweet fennel, and other medicinal and culinary herbs. Absinthe traditionally has a natural green colour but may also be colourless. It is commonly referred to in historical literature as “la fée verte” (the green fairy). Although it is sometimes mistakenly referred to as a liqueur, absinthe is not traditionally bottled with added sugar; it is therefore classified as a spirit. Absinthe is traditionally bottled at a high level of alcohol by volume, but it is normally diluted with water prior to being consumed. Absinthe originated in the canton of Neuchâtel in Switzerland in the late 18th century. It rose to great popularity as an alcoholic drink in late 19th- and early 20th-century France, particularly among Parisian artists and writers. Owing in part to its association with bohemian culture, the consumption of absinthe was opposed by social conservatives and prohibitionists. Ernest Hemingway, James Joyce, Charles Baudelaire, Paul Verlaine, Arthur Rimbaud, Henri de Toulouse-Lautrec, Amedeo Modigliani, Pablo Picasso, Vincent van Gogh, Oscar Wilde, Aleister Crowley, Erik Satie and Alfred Jarry were all known absinthe drinkers. Boat Quay 驳船码头 – a historical quay in Singapore which is situated upstream from the mouth of the Singapore River on its southern bank. It was the busiest part of the old Port of Singapore, handling three quarters of all shipping business during the 1860s. Because the south of the river here resembles the belly of a carp, which according to Chinese belief is where wealth and prosperity lay, many shophouses were built, crowded into the area. Though serving aquatic trade is no longer Boat Quay’s primary role, the shophouses on it have been carefully conserved and now house various bars, pubs and restaurants. Therefore Boat Quay’s social-economic role in the city has shifted away from that of trade and maritime commerce, and now leans towards more of a role accommodated for tourism and aesthetics for the commercial zone of which encloses the Singapore River. It is the soft front to the banking and financial sectors lying immediately behind it. Restaurant Absinthe prides itself to serving the finest seasonal ingredients and daily supply of fresh seafood. They have more customized set menus available for lunch, dinner, catering and canapés upon requests for your corporate functions, gatherings and events. Another value-for-money set meal is Buona Terra @ 29 Scotts Road (Italian cuisine). ← Starry Nights Are Georges! 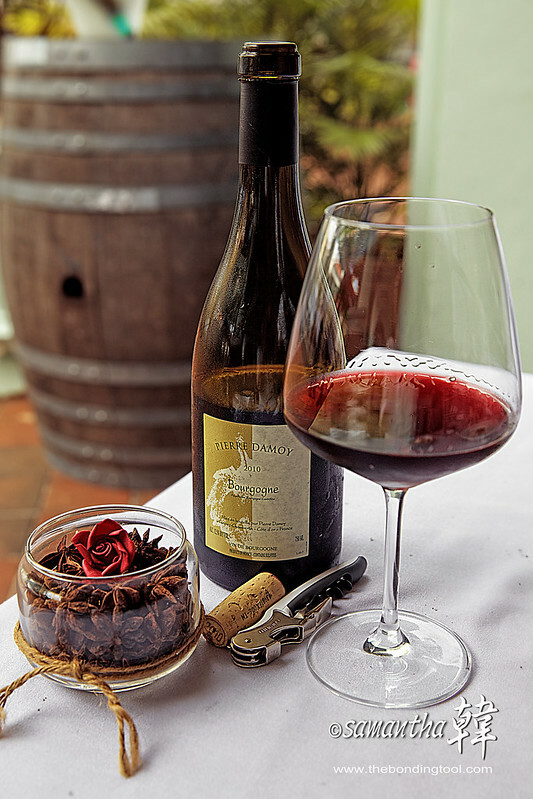 we do not grow older, we mellow like fine wine. Great review! Actually Absinthe restaurant designs some great set menus for seasonal or special events such as Mother’s Day next sunday.